If there was such a thing as a ‘military family’ living in Farndon at the time of the outbreak of the Great War then it would certainly have been the McNaught Davis family. John McNaught Davis lived with his wife Elizabeth and their family at ‘Willowmere House’ on Wyke Lane Farndon. It was a large family consisting of the mother and father and 10 boys and 6 girls and, to quote a resident who knew them, the boys “caused a certain amount of concern” which probably accounts for their career choices. Father was a traveller for the Sandeman Whisky Distillery and for many years served in the Sherwood Rangers Yeomanry which was the equivalent of a Territorial Army unit. He rose to the rank of Sergeant-Major and after his death the regiment commissioned a plaque in his honour which is still mounted on the north wall in St. Peter’s Church and commemorates his 30 years’ service to the church as sidesman and churchwarden and the 40 years he spent in the Sherwood Rangers Yeomanry . He served with his Regiment in the Boer War so military life was in his blood, which may well account for the fact that so many of his sons chose life in the armed forces in some form or another. Lionel served with the Royal Engineers for 22 years before becoming Lieutenant Quartermaster in the Lincolnshire Regiment. He was taken prisoner by the Germans during the Great War. Reginald became a Sergeant Major in the Sherwood Rangers. Charles was a Sergeant in the 17th Lancers and served in the Boer War, later becoming a Sergeant in the Army Service Corps. 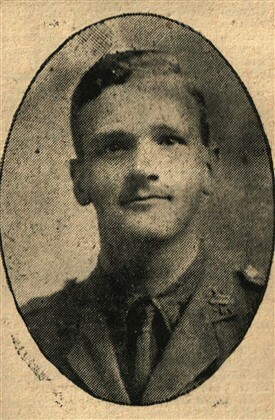 Stanley was at one time a Corporal in the Army Service Corps, but during the Great War was commissioned as a Lieutenant in the Royal Flying Corps. Leonard became Chief of Police in Griqualand in Africa. Valentine joined the Nottinghamshire Royal Horse Artillery. Claude became a Sergeant in the Scottish Rifles (the Cameronian Highlanders). Cecil was one time a Sergeant in the 9th Lancers. He died in South Africa. What a varied record that presents and all from the one family. The ninth son is the one who figures on the Farndon War Memorials – James Walden Fortune McNaught Davis. He went to Worksop College where he was captain of practically everything – the school, football, cricket and boxing – as well as being a member of the School Officer Cadet Corps. From there he went to Cambridge University where again he distinguished himself in Rugby and boxing and was contemplating a career in the church since during holidays he received some tuition from the Rev Ping, Rector of Thorpe, though he kept his options open by joining the university Territorials and becoming a Lieutenant. A glittering future lay before him. And then came the declaration of war against Germany and everything changed. Like so many young men, he couldn’t wait to enlist and get to grips with the enemy and like so many young men within six months he was dead. He enlisted in the South Wales Borderers as a Lieutenant and at first was posted to Pembroke Docks Barracks in an administrative role. So successful was he that they offered to promote him to the rank of Major if he would stay on in the post. But no – he wanted to go to France where the real action was and so that was where he ended up. But the South Wales Borderers were in the thick of the fighting. At one point a full battalion was reduced to 2 officers and 200 men. James himself had a narrow escape when a stray bullet glance off his belt, penetrated his tunic, grazed his stomach and ended up in his pocket. He brought it home as a souvenir. Early in January 1915 he had a spot of leave before setting off back on January 13. Four days later, at a place called Givenchy, he was leading a party of men to carry out trench repairs when he was hit by a sniper’s bullet (one version of the story was that he was standing outside the protection of the trench at the time). The bullet pierced his shoulder entered his stomach and created a fatal wound. He was dead within half an hour and his last reported words were “Good old doctor. Sorry to trouble you”. He lies buried in Woburn Abbey military cemetery, Cuinchy, in France. His family was inundated with messages of sympathy from the King, Kitchener the Minister of War, the chaplain and brother officers and his death was extensively reported in the ‘Newark Advertiser’. As a sad postscript his three medals – the 1914 Star and the War and Victory medals – were auctioned in 2003 for £800. Further information to your story. John McNaught-Davis & Elizabeth (nee Taylor) are my great-grandparents. I was born in Doncaster, Yorkshire, England in 1950 to Margaret (nee Mcnaught Davis) and Jack Erwin Service. My mom Margaret was the daughter of Charles Fortune McNaught Davis son of John McNaught-Davis. The military commitment continued with my mom who became employed with the British Fire Service during WWII in Britian. I thought you would like to know that there are blood relatives living in Victoria, British Columbia; Calgary, Alberta; Sarnia, Ontario in Canada & Twin Falls, Idaho USAand great-great grandchildren living in Singapore, Singapore; Maple Ridge, BC; Ottawa, ON; Montreal, Quebec; Whiterock, AB, Nanaimo BC Canada and Seatle, Washington, USA. Your article is greatly appreciated. Especially since my mom passed away in 2004. This is a real treasure for me. Thank you. Even further to the story, and Marylyn Service-Peters comment, John and Elizabeth were my Great-Grandparents as well. I am the son of Carol-Jean Elizabeth McNaught-Davis, daughter of Stanley Gordon. My Mom married a Canadian Airman stationed in England just after the war. They had me, and I did 30 years with the Royal Canadian Navy, recently retiring to Victoria BC, Canada. Maybe we are the Victoria BC relatives Marylyn is talking about.